Since then, I have mellowed a bit. Stretch marks can do that to you. Having a small child gnaw on your breasts with toothless jaws of steel, can do that to you. Having to clean up untold amounts of urine, poop and puke can do that to you. Having to wipe up bloody noses and skinned knees over and over, until you are a glorified nurse, can do that to you. Then there are the complacent types, happy to have children as long as the ride doesn't get too bumpy. I have a girlfriend who is like this. 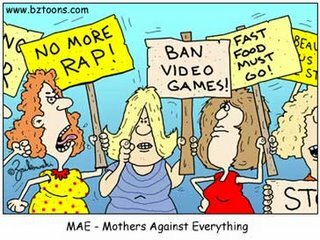 The type of mom where it is easier to let their children morph into psychotic little monster's who would glady tear your throat out and then stomp on it, than actually discipline them. Then there are the mom-Nazi's, who are against everything. Video games, music videos, Walt Disney. The Smurf's are satan-mongerers, dammit, and no you can't watch the Teletubbies. Shut up, play your flute and eat your granola. The mommies who would rather wrap their precious children in bubble wrap than a cute jumper from Old Navy. We all know the type. What ever type of mother you have, or may be, I salute you. Because being a mother is a labour-intensive (pardon the pun), time-consuming, lack-of-respect job. And it takes all kinds of mommies to make this world go round.